A student of the University of Ibadan, Faculty of Science Balkis Adeniyi, has died in a fatal accident that occurred on Mokola-Oyo Road in Ibadan, Oyo State, on Friday 12/04/2019. 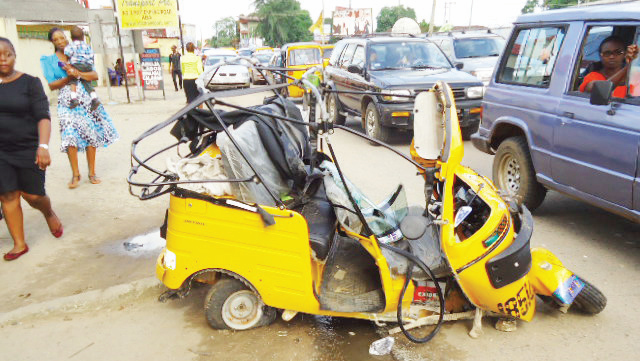 Eyewitnesses told City Round that the accident also left two other victims seriously injured as a tricycle popularly called Keke Napep or Keke Marwa, rammed into a waste disposal truck at Leventis area of Sango in the metropolis. The accident occurred around 9:30am while the lady was returning from a bank where she had gone to pay her school fees. The Oyo state police revealed the number plate of the tricycle as RU 152 UP and described the truck as ‘MARC LAMMERTYN’. The eyewitness said, “The lady who just left a bank at Ajibade where she had gone to pay her school fees. The Police Public Relations Officer in Oyo State, Olugbenga Fadeyi, confirming the tragedy, when asked he replied by saying “Yes, it was true.